The Sashastra Seema Bal today seized cannabis weighing over 1,000kg and worth around Rs 8 crore from an abandoned truck at Fulbari on NH31D. D.K. Singh, the second-in-command of the 41st battalion of the SSB, said: "We got information that a vehicle from Manipur loaded with cannabis will move through Fulbari bypass area this morning. Our men had been waiting but they could not trace the truck as the registration number that we got from our sources didn't match with any vehicle." Later, a truck with an Assam number plate was spotted at Fulbari on the outskirts of Siliguri. "We contacted New Jalpaiguri police and searched the vehicle," Singh said. 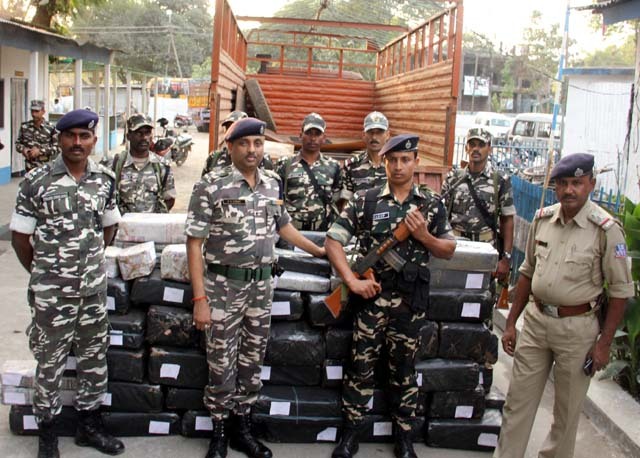 Sources in the SSB said 1,009kg of ganja packed in 97 packets had been seized and the smugglers were taking it to Bihar. Singh said the cannabis was worth Rs 7.9 crore. 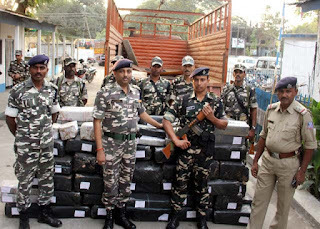 "The cannabis had been smuggled from Manipur. The ganja was wrapped in plastic packets. The packets were hidden in a compartment inside the truck," he said.